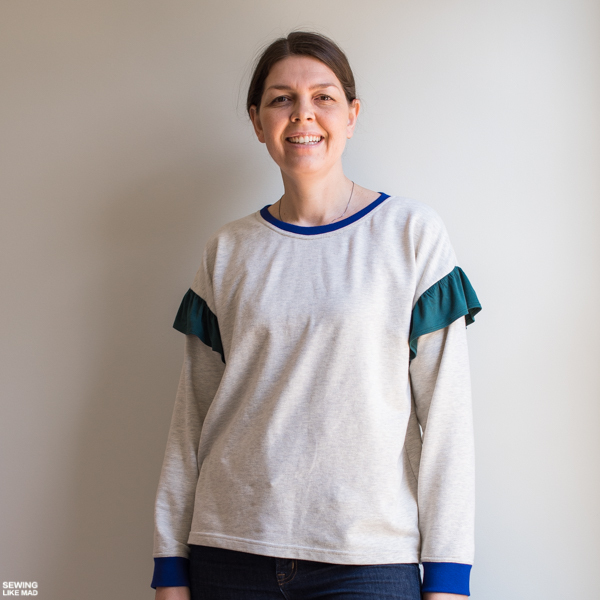 I promised you a blog post about this pattern, the Kyoto Tee by Papercut Patterns, because I had some concerns/comments. This pattern is one of those hyped patterns and I understand why. 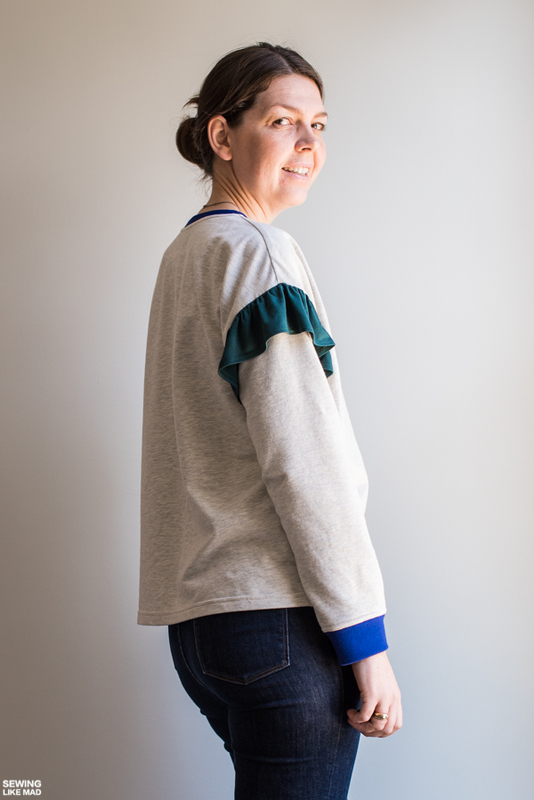 The whole Sakura collection took the collective breath away from the sewing world and this pattern, the Kyoto Tee, was definitely the most approachable. And we all love a quick and satisfying project. I try, and I repeat try, not to fall too much for hype. I want to make sure it's something I'll wear first and foremost. But I also want to make sure the technical side of the pattern lives up to my expectations. In this case I think I got blinded a bit by hype and I forgot to do my homework. So many people sewed this and most looked really good. In fact the only problems I saw was choosing size. 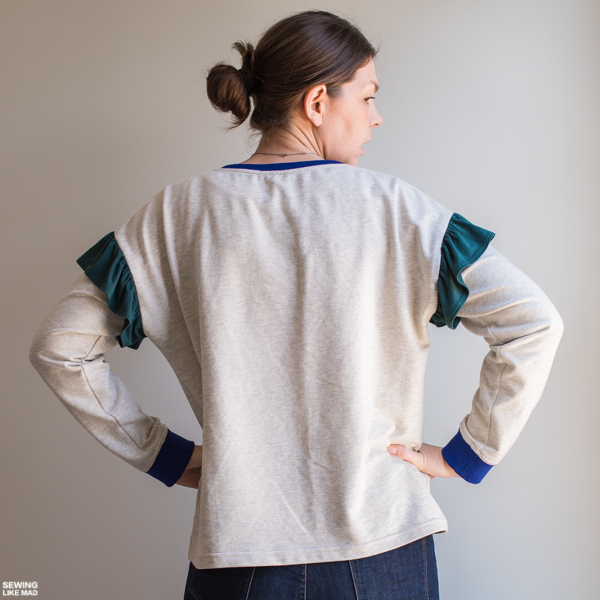 Some ended up with too big tees/sweatshirts with a ruffle hanging too low, which gave it a bit of a droopy look. Quickly it became common knowledge that this collection runs big. Which is not the biggest problem as long as you know about it. 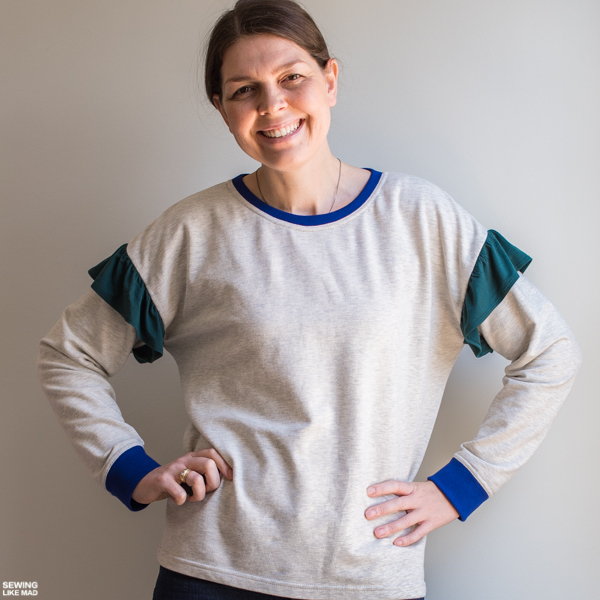 I determined that since I was making it in French terry (although on the thin side and quite stretchy) (from Raspberry Creek Fabrics) and was aiming for a sweatshirt look I would make size M. If/when I'm making it as a tee in regular jersey I'll downsize to a S.
But size M was perfect for this. I was happily taping my pattern together when I stopped in my tracks. 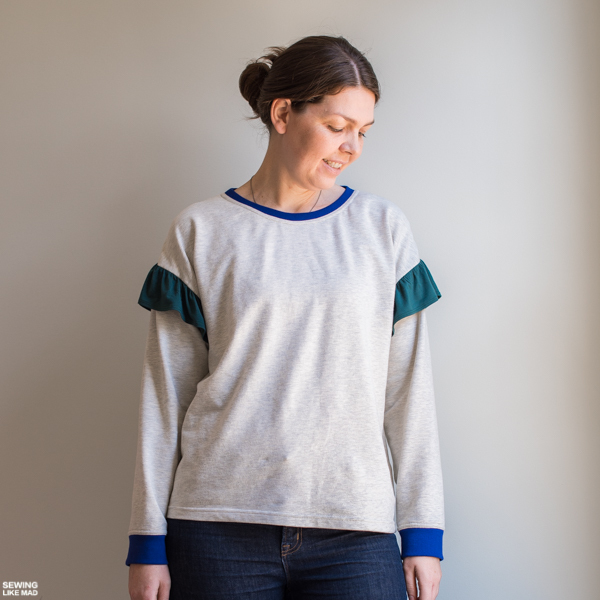 A pointy sleeve cap?! (Photo further down). My initial thought was no, just no. Then I thought well, maybe it's a design feature, so I checked the tutorial. But they show it sewn with a slightly rounded top which doesn't make any sense. If a pattern has some kind of non-curved angle, you need to pivot. 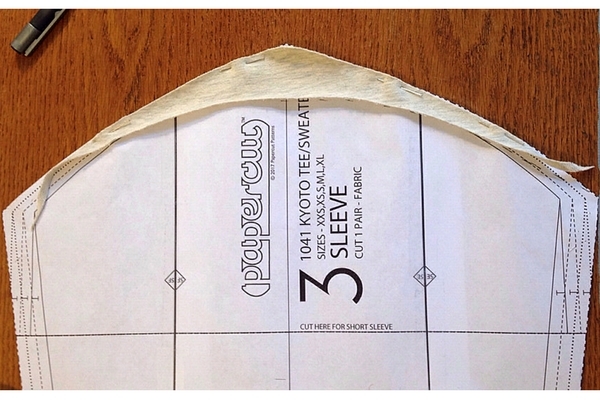 If you want a round seam, your pattern should be rounded too. So I emailed Papercut Patterns and asked if it was a design feature (although they clearly didn't utilize it), but the friendly reply was that the reason is fit. So a pointy sleeve cap should give the correct fit. Hmmmm. Then of course the insecurities started showing up. It's not like I know everything about pattern drafting and fitting. Maybe they had invented something new and genius. 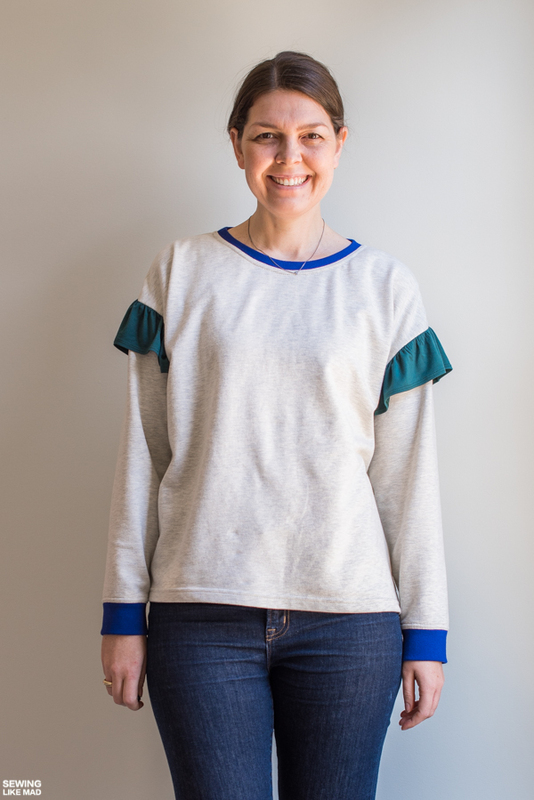 My working theory was that a pointy (and too high) sleeve cap would create a shoulder bump on a dropped shoulder style like this one. But looking at other people who have sewn this didn't help since the area in question is hidden by the ruffle, ha. 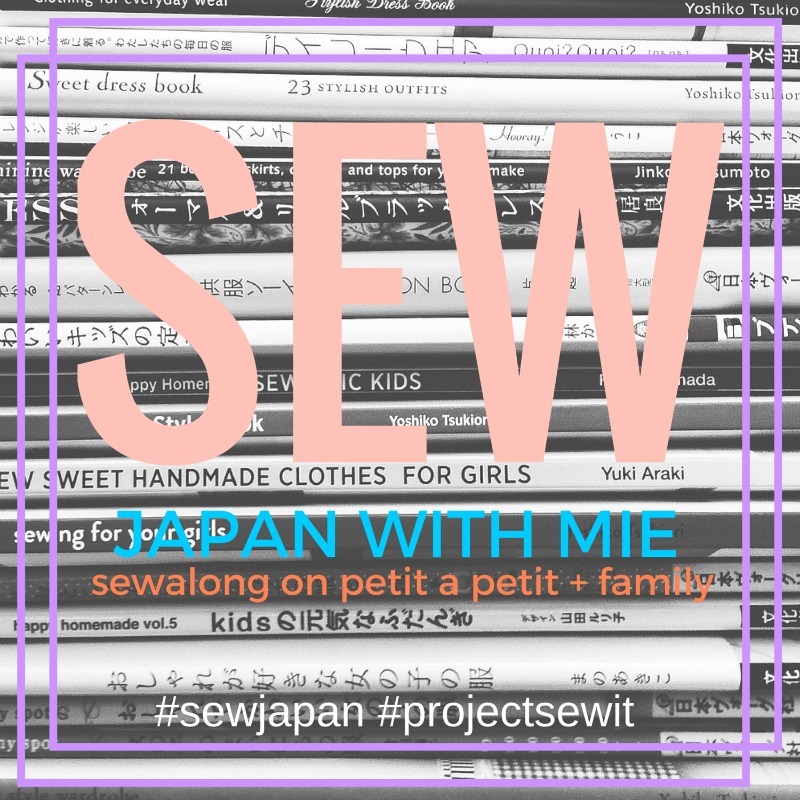 SO what does a stubborn sewist do? Sew it without the ruffle of course. Or more precise, I basted in the sleeve first without the ruffle and bingo, unwanted shoulder bump on my arm. Of course if I'd known that you would request a post about this, I would probably have taken a photo, haha. At least I took a photo of how much I ended up taking off the sleeve cap for a good and smooth fit, which is what you can see above. As you can see, now it it's lower and smooth. And then I unpicked the basted stitches, added my ruffle and ended up with a Kyoto Tee that looks like everyone else's, haha. But now I was happy too. I also have a comment to the ruffle itself by the way. I turned the ruffle upside down and hemmed the straight line. To me it looks like the exact same result but it's always easier to hem a straight seam versus a curved one. This is not a right vs wrong case, so do whatever you prefer but I thought I would mention it. And this concludes the curious case of the pointy sleeve. I love the final result! Glad there is no bump on the arm! 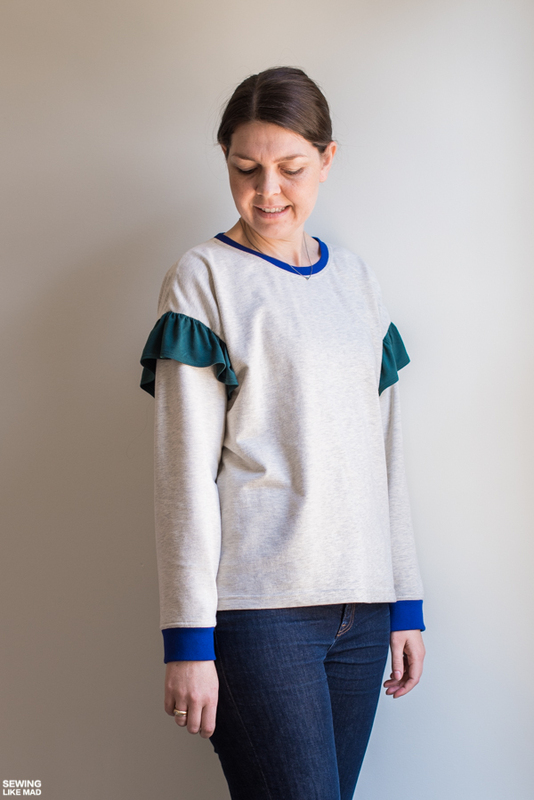 I still can't get over the fact that in my joy over the finished look (hidden by the ruffle), my brain just pretended that I never saw the pointy sleeve! Thank goodness for you <3 And I love the colors on this one! 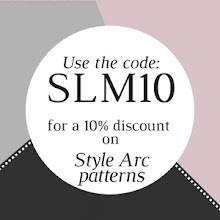 Thank you for helping out the sewing community again!! That's a whole lot of money for a badly drafted pattern! But your sweatshirt looks great!